In the beginning of the year, I started exploring mixed media. This technique can be very messy, complicated and lots of layers. At the beginning it intimidated me, but then I figured out that mixed media can be simple, too. Mixed media is basically you mix more than 2 mediums on your project. 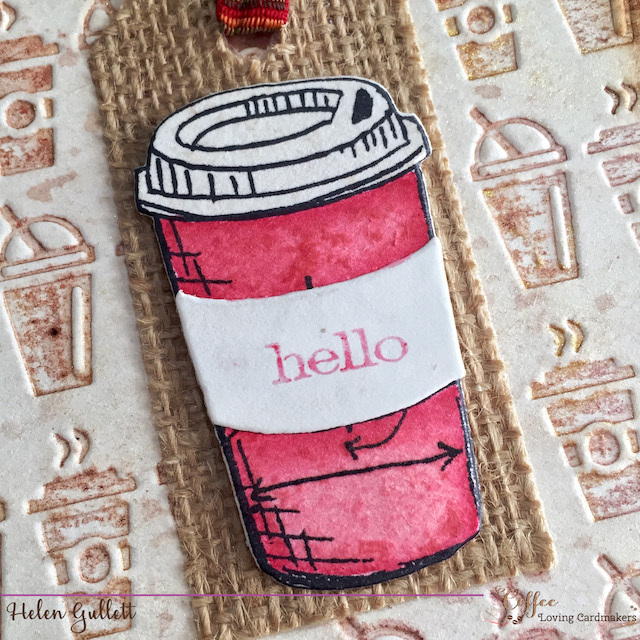 So, today, I would like to share with you a simple CAS Mixed Media card with the Sizzix Tim Holtz Alterations Stamp, Die & Texture Fade – Coffee Time and Sizzix Tag die set. First, I created my background with the embossing folder. I added the Canson watercolor paper on the folder and run it through my die cutting/embossing machine. And then I added Hero Arts – Autumn Ombre Ink on the raised side of the embossed paper, and then spray with the mixed of Perfect Pearl and water in my mini mister. That mixture of spray give the watercolor look and pearly shine on it. On another piece of canson watercolor paper, I stamped the cup image from the same set with Versafine Onyx Black and then watercolor it with Spectrum Noir Aqua Marker (Crimson). You can see, I am inspired but the Starbucks red cup 🙂 After the image dried well, I die cut it with the matching die that comes from the same set. I also die cut the sleeve our of white card stock and I stamped the word hello as the sentiment from the same set with Hero Art Red mini ink pad. I die-cut the burlap using one of the Sizzix tag die cut set. Then I added a piece of ribbon on it and secured it with CTMH Mini Stapler. 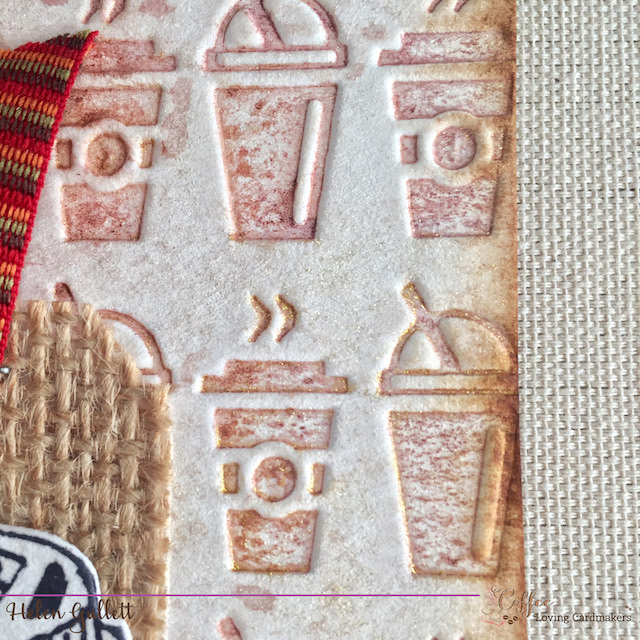 I added the burlap tag on the card with CTMH Liquid Glass Glue (multi purpose glue), and then I added the cup on the burlap with 3D foam tape for extra dimension. That’s my CAS Mixed Media card with some inking/stamping, embossing, watercoloring, shimmer spray, burlap, ribbon, and cardstock. Simple yet has more than 2 mediums I used on this card. There are many ways you can create mixed media project. 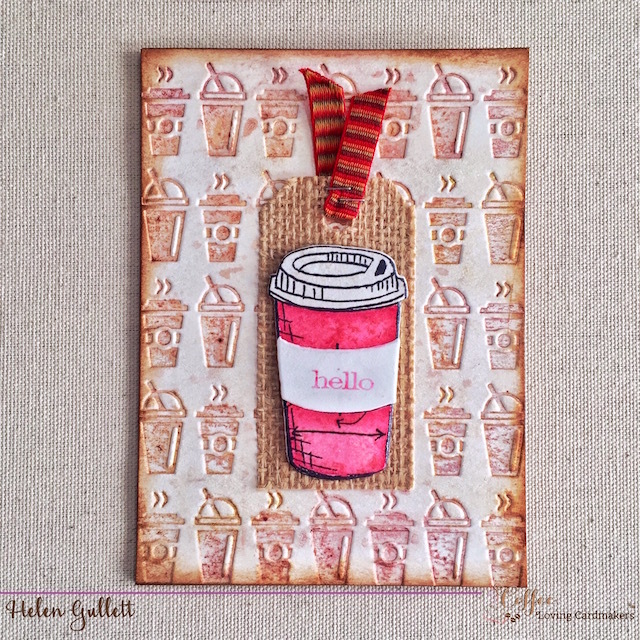 I am sharing this project at Coffee Loving Cardmaking blog today. Visit us there and see coffee-loving inspirations from the team! THANKS A LATTE for visiting me today and have a fabulous creative day! Love what you’ve created, Helen! I just love the look of the embossed and colored background – the texture adds so much to that! Superbly executed! !